That caught our attention. 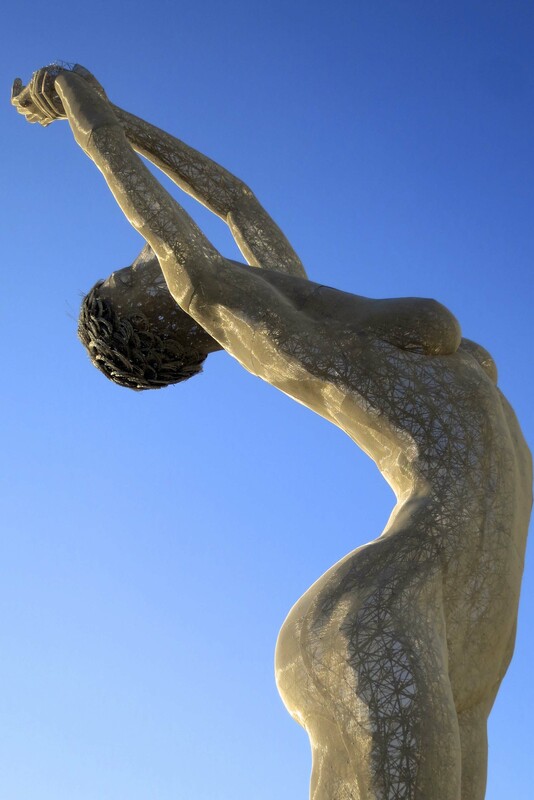 Peggy and I had been blown away by Bliss, a 40-foot sculpture of a female dancer. 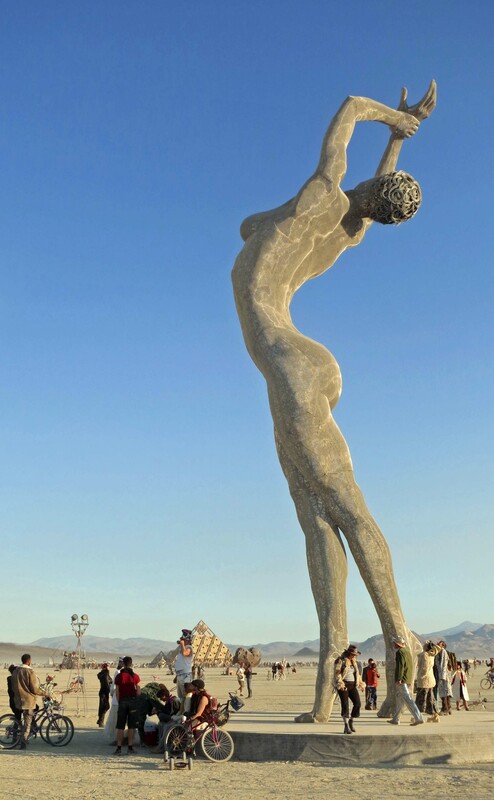 So we were excited to learn that the same artist, Marco Cochrane from Mill Valley, California, had produced a new sculpture for Burning Man 2013, another colossal female named Truth Is Beauty. 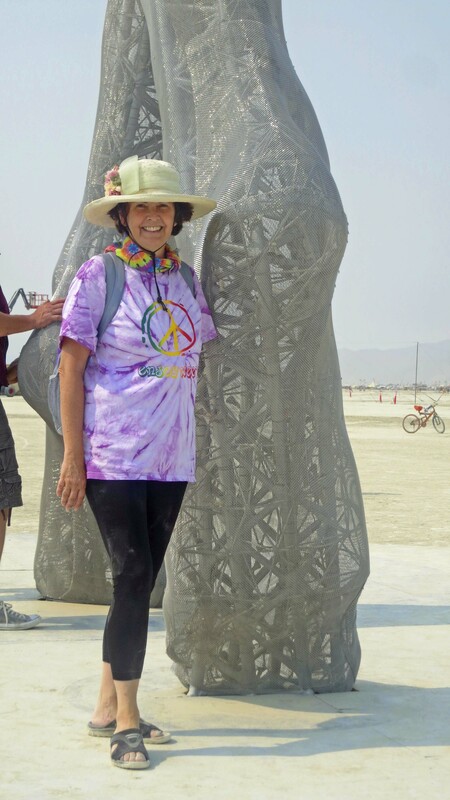 After visiting the Man and the Temple (always our first stops at Black Rock City), we cycled over to see the Woman. I’ve capitalized the W because the sculpture deserves it. Truth Is Beauty is 55 feet tall. We were awed. Peggy and I returned to visit several times during the week. Follow your bliss and doors will open where none existed. 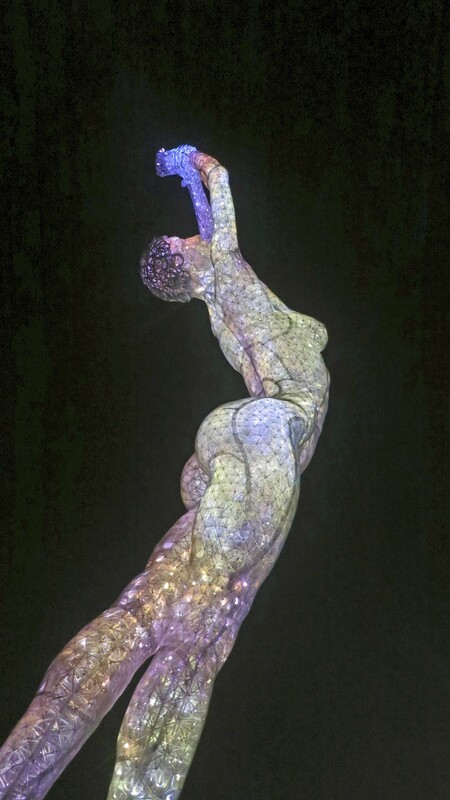 The original Bliss sculpture from Burning Man 2010 now resides on Treasure Island, San Francisco, where Marco has his studio. The statue weighs 7,000 pounds, is 97% air, and includes 55,000 welds, all done by hand. The internal framework is based on a geodesic structure (thank you Bucky Fuller), and includes 4500 ball joints. 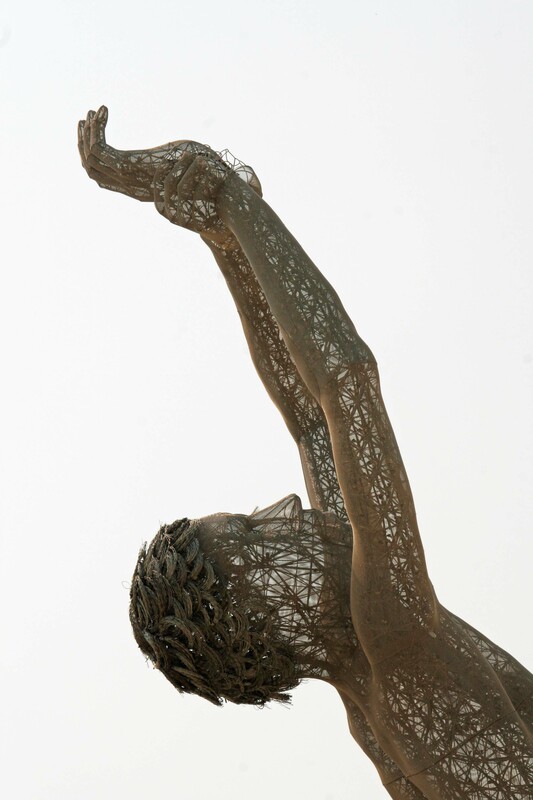 The “skin” consists of a steel mesh stretched over the structure and screwed on. 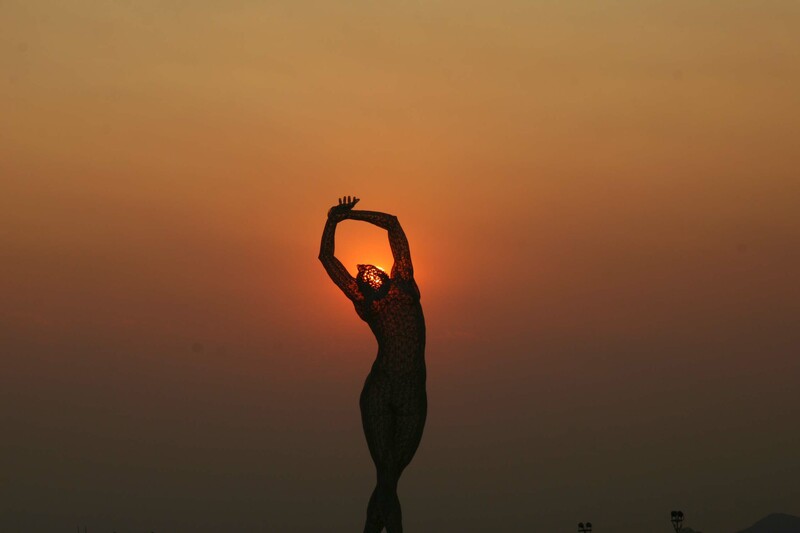 Bliss at Burning Man in 2010. Marco used the same model, Deja Solis, a six-foot tall singer/dancer from the Bay Area, for both Bliss and Truth Is Beauty. His goal in working with a model is to have her relax, feel safe and be herself. He then works to capture her essence and recreate it in his works of art. His goal is to help us move beyond seeing a woman as an object and see her instead as another human being, a rather large human being. If you would like to learn more about Cochrane and his projects I would recommend going to his website. There is also an excellent interview by Matador Network. Following are a number of photos designed to capture Truth Is Beauty from different angles and in different lighting conditions. Enjoy. 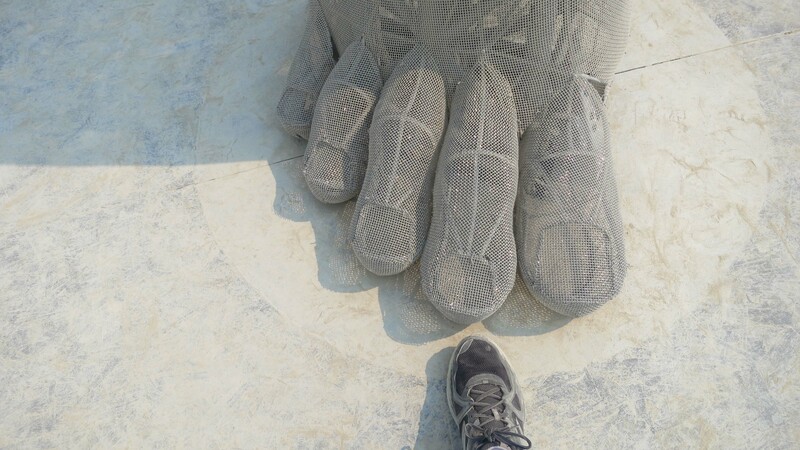 To provide perspective on the size of the statue, these are her toes and my foot. BTW, I wear a size 14 shoe. Peggy provides perspective on Truth Is Beauty’s foot. This photo also provides a good look at the inner construction of the statue. 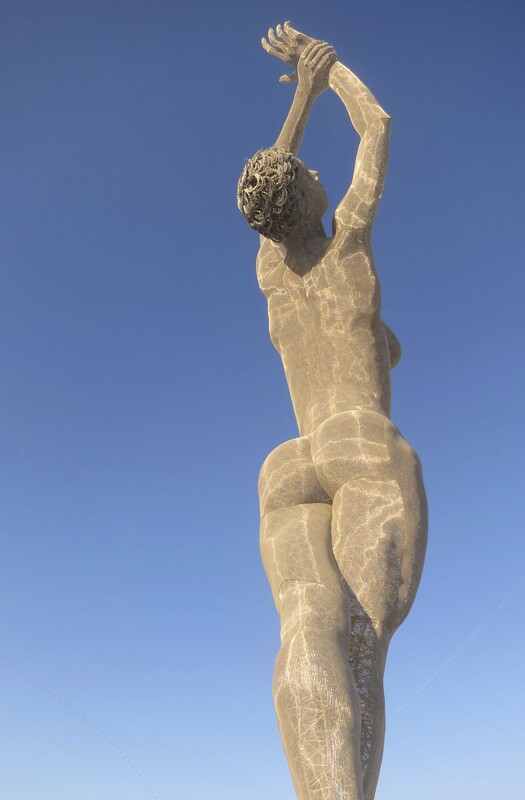 A side view of the sculpture outlined by the early morning sun. 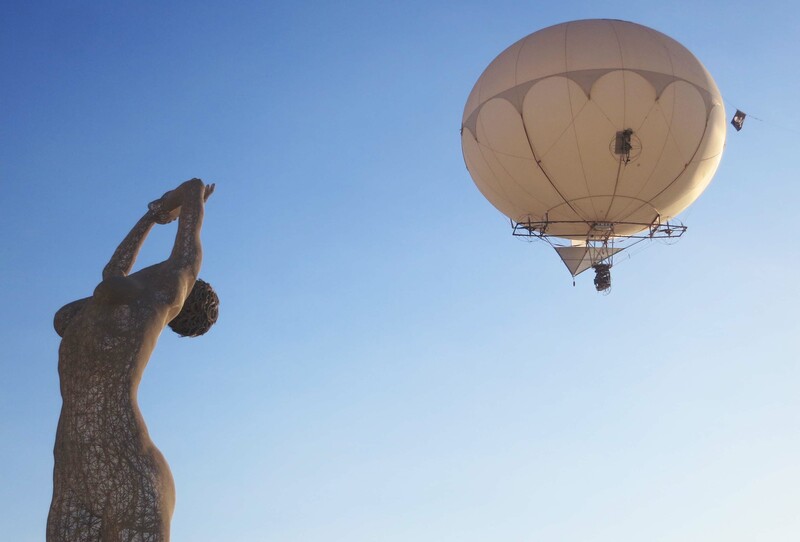 As you might imagine, photography is big at Burning Man. 68,000 people probably means 68,000 cameras. This photographer attached his camera to a large balloon to capture unique perspectives on Truth Is Beauty. From the ground up, Truth Is Beauty almost becomes abstract. 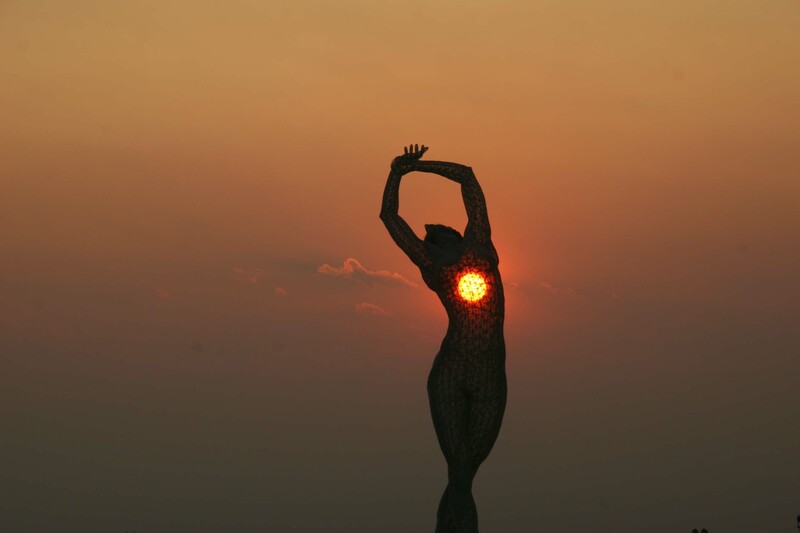 The magic of night at Burning Man, also applies to the art. 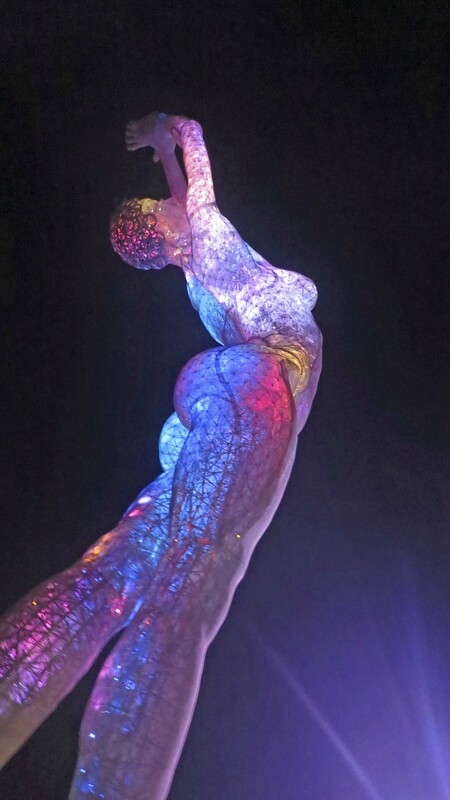 Using a series of LED lights inside the statue as well as outside lighting, Truth Is Beauty evolves through a number of almost mystical colors. Outside lighting gives the statue a sense of solidness. 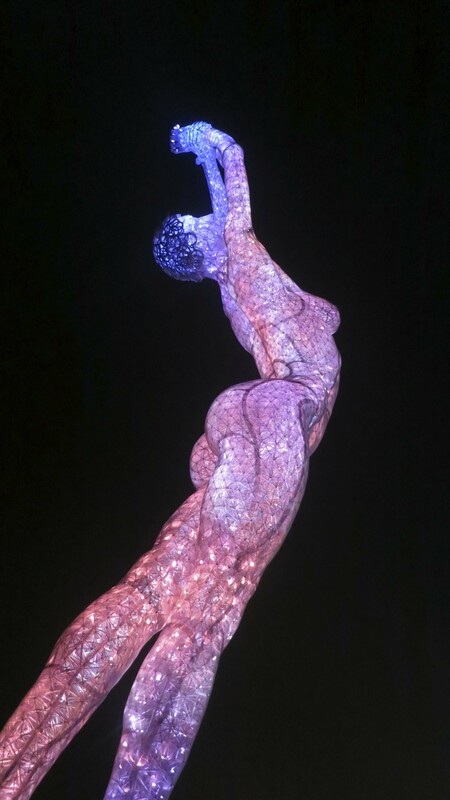 The LED lights give the appearance that the sculpture is filled with stars. I took the following three photos from the same perspective to show Truth Is Beauty as she changed colors. Our friend Tom Lovering (AKA Adios) from Davis, California has a good eye for capturing unique photos. He was up before the sun to be out on the Playa for these pictures of Truth Is Beauty. I will conclude with these photos. 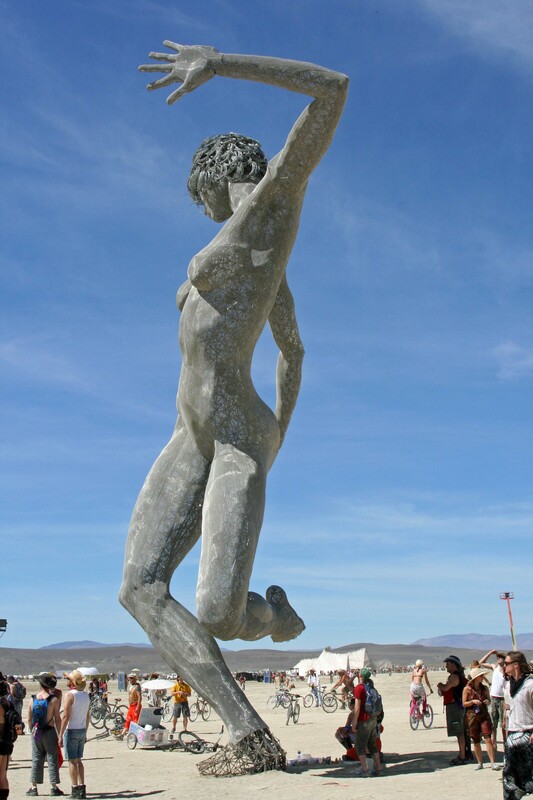 If you enjoyed this blog, you might want to check out my top five reasons for going to Burning Man in 2014. 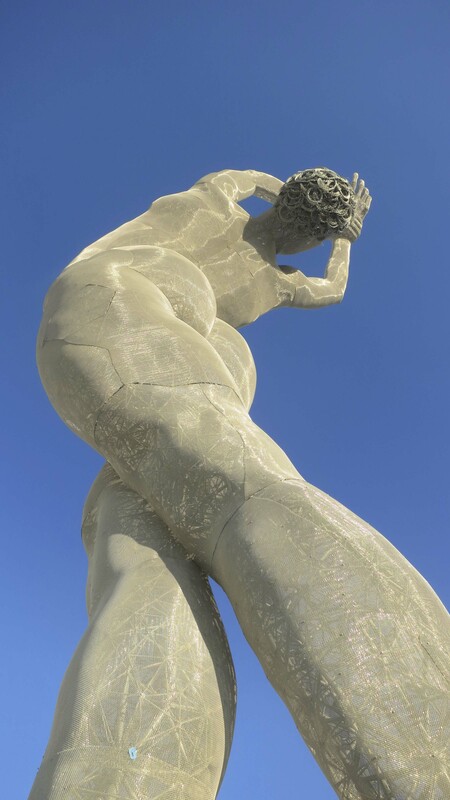 NEXT BLOG: Two very unusual churches at Burning Man.